Orlando will be rocking this weekend, but there’s only one place where the good times roll. Alternative rock band Lifehouse kicks off Universal Orlando’s Mardi Gras celebration this Saturday, Feb. 9 with a live performance on the Music Plaza stage. Along with the live concert, guests can also experience an authentic, family-friendly version of Mardi Gras at Universal Studios Florida. Running on select nights through April 20, the event couples theme park entertainment with a dazzling parade, authentic New Orleans bands, delicious Cajun cuisine, tons of Mardi Gras beads and live concerts by top-name artists. The full concert lineup is below. 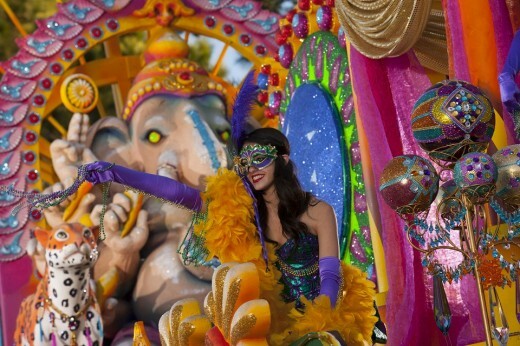 This year’s Mardi Gras parade celebrates “Colorful Cultures Around the World,” featuring all-new float additions inspired by the Mexican Day of the Dead, Chinese New Year and Elegance of India. The parade’s elaborate, hand-crafted floats are built by Blaine Kern Artists – the same company that designs floats for the Mardi Gras parade in New Orleans. Where do you like to watch the parade from? What is your strategy to get the most beads… keeping it PG, of course.